If you’re planning a move or renovating a home or office, A.B. Richards will help you stay organized throughout the process. If you need extra storage space while waiting for a new home to have work done, or if you have a family member, such as a college-aged child move back in, we recommend our 20ft portable storage units. If you’re in the process of relocating a business or organization and you need storage for inventory, records, or office furniture, try our 40ft storage containers or 40ft Jumbo Storage containers with an extra foot of headroom. We want the move to run smoothly, so here are some tips on properly lifting items when you relocate or move. If you’re dealing with a residential or office move, carrying furniture can be among the most dangerous things to lift because of the weight. Thus, you’ll need to plan before you lift. According to the website Moving Tips, in addition to clearing a path for moving, you need to make certain that you’re wearing proper footwear. Closed shoes with rubber soles often work the best because they give you traction and flexibility. Also, don’t try to move stuff entirely by yourself. Have a friend or family member help or hire a professional mover. When you’re ready to relocate the furniture, think before you lift, and assess what you’re trying to do. Keep your feet wide and stable as you get ready to lift. Your back posture will be important to reduce injuries. 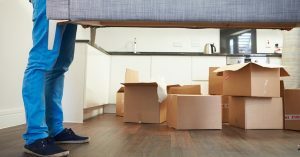 While moving, walk with your feet, but be careful of twisting your back. If you’re in charge of an office move, The Business Journals suggests it’s important you make clear to your employees that workplace injuries can and do happen, while outlining some examples. Additionally, to help with the move, you should take your employees through the steps of proper lifting. When you’re planning a move, A.B. Richards hopes you do it safely and efficiently. There’s no need to rush through things. Plan carefully and think about every step or the process. A.B. Richards will also make sure your storage container will get to where you need. it. We’ll deliver it to you and pick it up when you’re done using it. To get started, contact us today.